Service at Carroll College is very community based. Carroll is especially blessed to have the support of many community members who are always being asked for donations to fund various activities. For this reason, we students think it is very important to remember all that the community has done when we plan any service. As a campus we made the decision a year ago to complete one day of service per semester to give back to our community. Since then, with the help of Catholic Volunteer Network and Catholic Extension, we have expanded this desire to twice a semester, and next year we want to increase to once a month service days. One major reason we hope to add to the number of days is because of the amount of student participation we have involved in service! Last semester Carroll Students combined for just under 35,000 hours of service, and in our last service day sponsored by Catholic Volunteer Network and Catholic Extension we had 75 students participate which was also during a very large snowstorm. Some projects students served for on our day of service were collecting toiletries for a women’s shelter, serving meals at the homeless shelter, visiting the elderly, cleaning a single mother’s shelter, and various organizational work for Good Samaritan Ministries. My day of service began with Mass because reflection is necessary for us to accomplish what God truly intend our work to accomplish. We must first receive God’s love through the Eucharist, thus, filling our hearts, then in order to keep God’s love we must give it in service to others, emptying all that we have been given. Through service, more room is created in our hearts for His love to enter again. The more we serve the sooner this cycle becomes a continuous flow of giving and receiving. For this reason I, along with many Carroll Students attend Mass before serving. Mass reminds us of the great “Why” of our lives because God loves man our purpose is to love Him back. This cycle makes even the most tedious of jobs meaningful because we have oriented our lives to the “Why.” My day of service was filled with scrubbing the walls of a women’s shelter for pregnant teens. That is all I did for five straight hours, and though I would have preferred to work with people in a more direct way, God gave me everything that was necessary for me to fulfill the giving of His graces in service at that moment. I am always surprised how I am affected after serving because it is never how I expected. God’s gifts always exceed our expectations. Service is direct participation in God’s creation in which we allow God to break into our hearts because we are open to giving without expecting anything in return. This is what it means to me to serve and this is why I find it necessary to serve whenever possible. 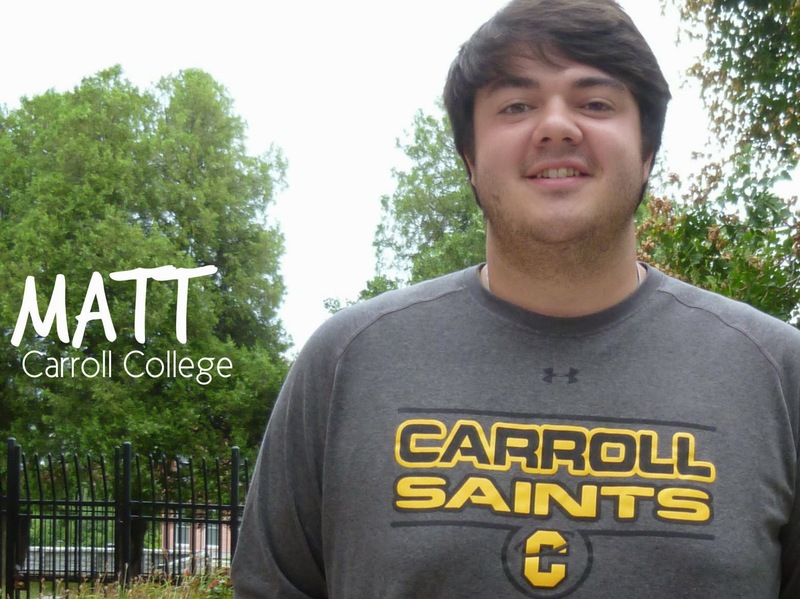 Matt serves as a Campus Recruitment Associate, through Catholic Volunteer Network and Catholic Extension. His role is to help Carroll College further expand it’s service outreach and encourage more students to get involved.